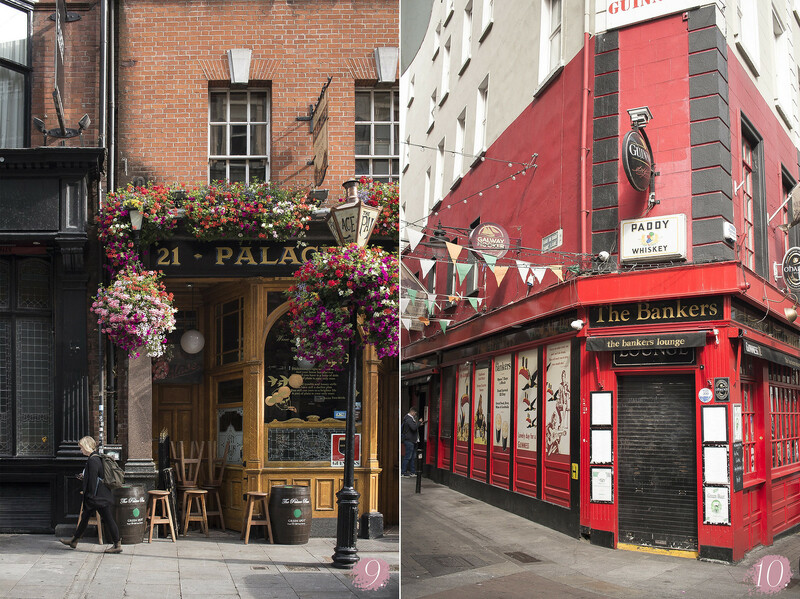 Whether you come to Dublin for the pubs or not, you’re going to see a lot of them. They’re the most important feature of the cityscape’s fabric. Chances are you’ll want to photograph a few, so I thought I’d compile here a list of the pubs I think would look really cute on your Instagram feed. 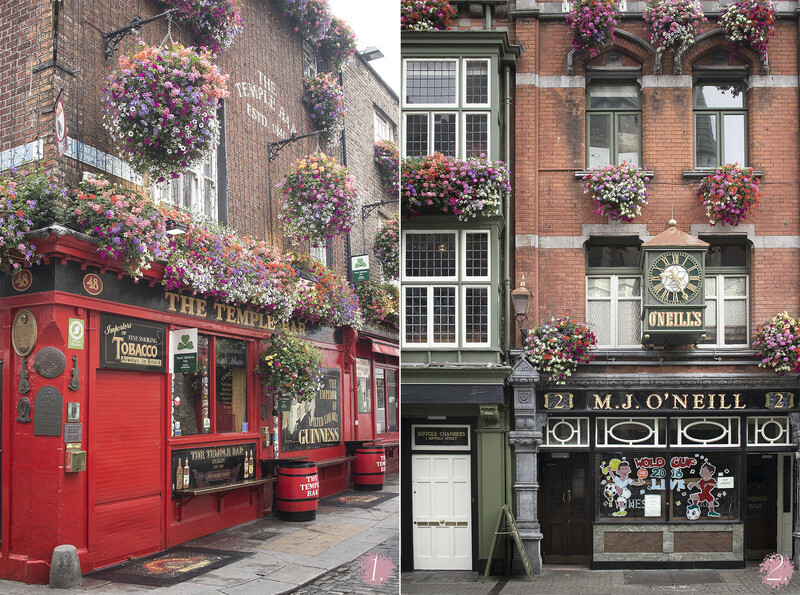 For me, Irish pubs are at their handsomest in Summer when they’re covered in flowers. Mind you, they do look rather cosy too when all their halls are decked for the festive season. This is a very shallow list, we’ll only judge these pubs by their exterior looks here although some of the pubs below are really worth a visit too! Keep scrolling to read my top 10 most instagrammable pubs in Dublin (there’s a map at the end of this post to help you on your ‘photo pub crawl’). Happy snapping! This is the pub everyone wants to see when they come to Dublin. 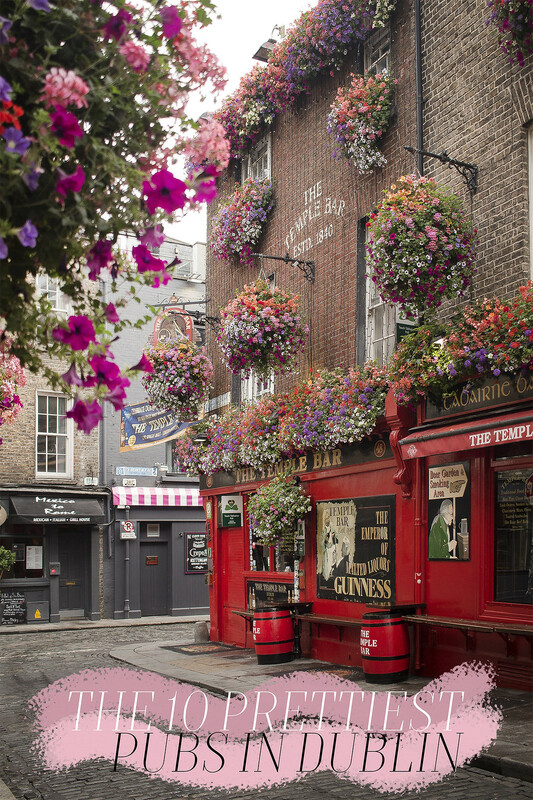 In the heart of Temple Bar, the Temple Bar Pub attracts the eye with its shiny red facade. What I love about this one is that the owners don’t go half way with the decoration. You can bet that come Summer it’ll be covered from top to bottom with geraniums. And at Christmas, it’ll twinkle with a thousand fairy lights. O’Neill’s is one beast of a pub that spreads on the corner of Suffolk Street and Church Lane. It dominates the street with its four floors of red brick and Tudor-style windows. I never tire of its jolly green facade, especially when it’s covered with flowers in the warmer months. The facade features lots of interesting details among which a rather attractive three-dial clock. Another imposing building is the Bank Bar on College Green. It’s huge, it even has a turret! Its grandiose allure comes from the fact that it used to be a bank, as you may have guessed it. Of course the inside matches the glorious outside. What I love the most about this pub is the warm tone of the sandstone covering its exterior. It changes with the lighting of the seasons. It is unique in the Dublin’s cityscape and it absolutely pops out. 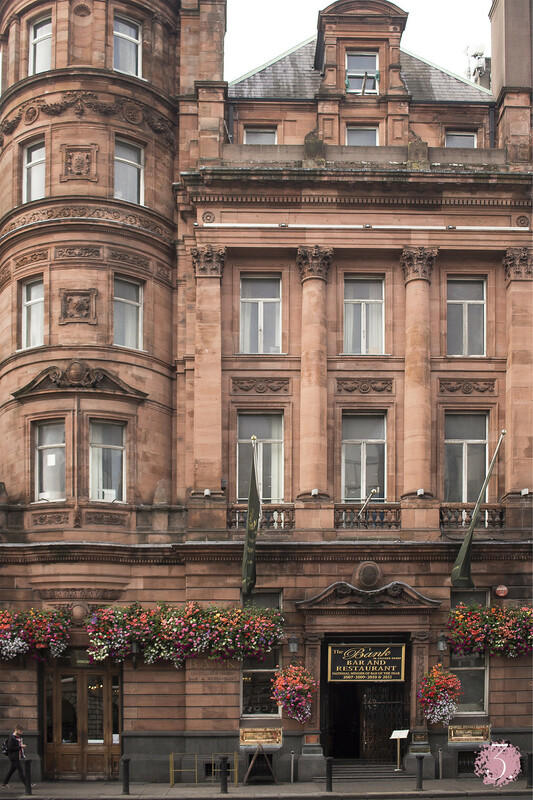 This pub is a shining landmark on George’s Street. You definitely can’t miss it with its enchanting red and white canopies. It almost looks like an ice-cream parlour of a bygone era. 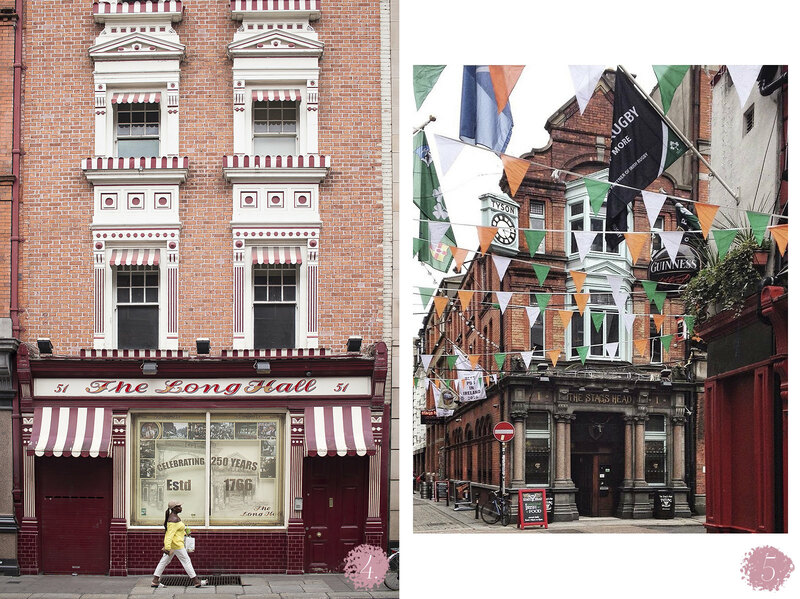 It’s not all about the look as you’ll know if you step inside, The Long Hall is one of the most spectacular examples of a preserved Victorian pub in Dublin. Well worth a pit stop! It seems I have a thing for clocks adorning pubs. This one is painted in a vibrant Tiffany Blue. On it, you can read the name of the pub’s original owner, Mr. Tyson, back in the 1890’s. Like the Long Hall, the Stag’s Head is another beautiful Victorian slice of life frozen in time. You’ll find it on the corner of Dame Lane and Dame Court which is one of the liveliest areas on weekend nights. On days of celebration or football match, the whole court is covered in bunting which makes the Stag’s Head look even more special. If you’re looking for an understated or subtle pub facade then you probably want to look away now. 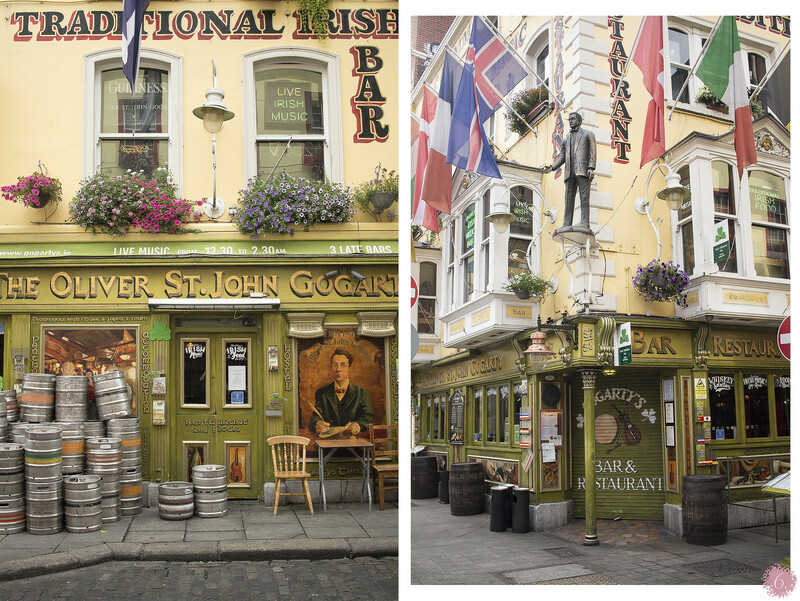 Located in Temple Bar’s oldest buildings, the Oliver St. John Gogarty is a sight for sore eyes. Half green, half yellow, its front counts more flags than an Embassy quarter. The pub takes its name from the Irish poet which you can see several incarnations of around the building in the shape of portraits and statues. Bruxelles is that red brick castle-like building just off Grafton Street. Its gothic style gives it a gloomy, melancholic air but don’t be deceived by its looks, Bruxelles has known many wild nights. Just outside is a statue of Phyl Lynott who used to come and perform here. On Temple Bar Square, the tiled corner of The Quays is rather eye-catching. I think it’s the Seventies colour combination of green, mustard and brown that does it for me. Besides, it’s not that often that you see a tiled pub front in Dublin. Pretty unique, I think! 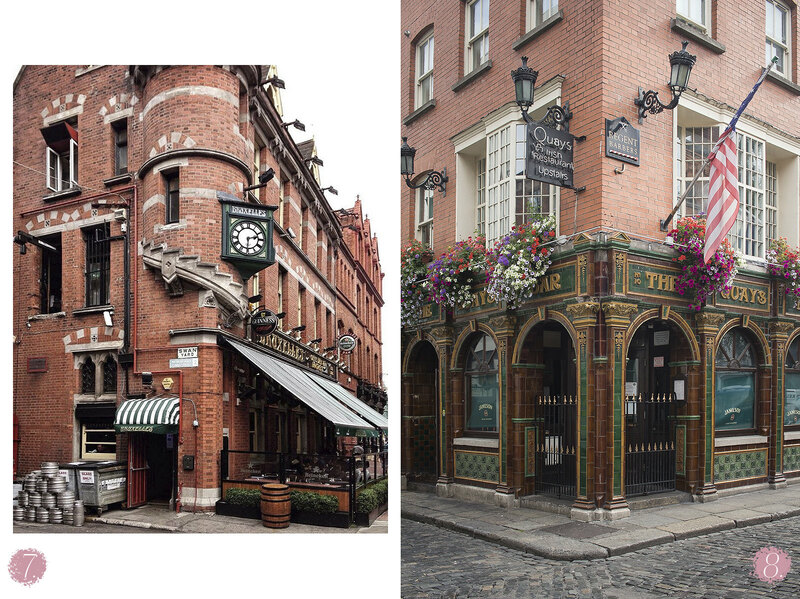 At the edge of Temple Bar is located the picture-perfect Palace Bar. Its narrow front sports beautiful wood-panelling and inside, you’ll step in another Victorian bubble where the decor has not been changed since the pub’s beginning in 1823. But the detail that steals my heart is the elegant copper lamp post outside. It looks so old-timey, you’d almost expect it to be gas-powered. The Bankers is an odd-shaped red pub at the entrance of Dame Lane. You could say it’s the ‘Flat Iron’ of Dublin pubs! It looks so jovial and keen like a ship’s bow at the ready for new adventures on the sea. I always like to have a nosey through the small window panes when I walk past it. Especially on cold nights, as the glowing inside often reminds me of a scene you’d find on an Irish Christmas card. So which one you’ll want to photograph first? Do tag me on Instagram @theartofexploring, I would love to see your pictures! Let me know in the comments, do you agree with this list? Is there a pub that you would add here? Good post Nora ! Perhaps the only one you missed was Davy Byrne´s, which is mentioned in Ulysses. I also like The Duke, which is on the same street. Greetings. Alex. As a Dublin resident, I have to say I am a tad shocked to see THE OLIVER ST. JOHN GOGARTY featured. The reason I say so, is because it has appeared numerous times in posts on social media by people who have been outraged by the prices they charge for all drinks, including non-alcoholic ones. Hi Michael, thank you for your comment, I completely agree with you, the prices are shocking there. I meant this list to be about pubs’ outside looks only (although i did try to note when the pubs are worth a visit too). I thought it would be helpful for photography enthusiasts who come to visit Dublin. Sorry if it was confusing!